2018 marks a very special year for Blossom World Society as we commemorate our milestones and the 10th year in Building Character, Nurturing Kindness in every beneficiaries and youth of today and tomorrow. 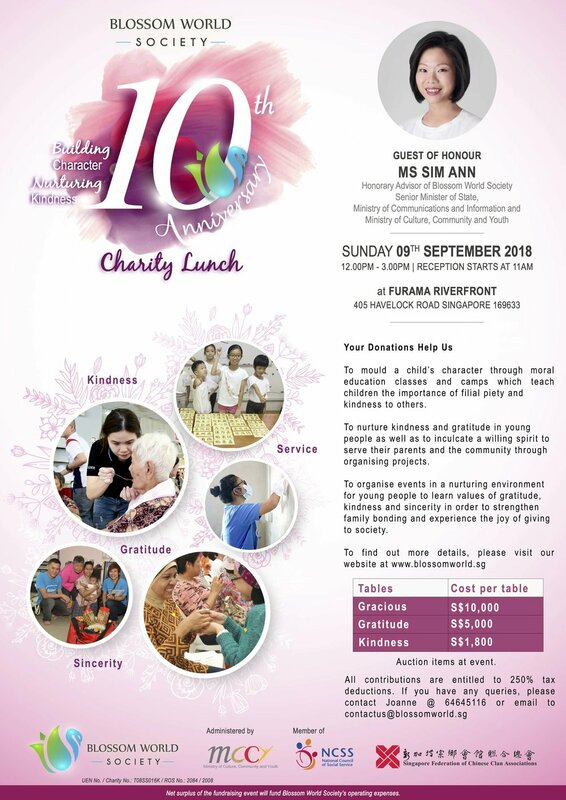 Blossom World Society is organizing its 10th Anniversary Charity Lunch on Sunday, 9 September 2018 from 12pm to 2pm at the Furama Riverfront Singapore. We are pleased to have our Honorary Advisor of Blossom World Society, Ms Sim Ann, Senior Minister of State, Ministry of Communications and Information and Ministry of Culture, Community and Youth to grace our function. It is our great pleasure and honour to invite you to our Blossom World 10th Anniversary Charity Lunch 2018 to join us in this joyous occasion in commemoration of our milestones and to join us in our journey in nurturing the youth of today and tomorrow. BWS has been organising activities since 2008 for children, youths and the general public from diverse backgrounds and families. The programmes are constructed based on our values (Sincerity, Kindness, Gratitude, Service), our goal in co-creating a gracious Singapore and through various means to appeal to different interest groups while at the same time contributing back to the society. Funds are required to outreach and benefit more people to work towards a gracious society and for expansion and sustainability. BWS will have an exhibition booth to showcase our past achievements and future plan in the area of moral education and youth development. We hope that you could attend this event and we will be happy to show you what we have done. Please invite or involve your business partners and friends to support this meaningful cause. Table purchase and outright donations will be entitled to 2.5 times tax exemption. Please fill in the Response form and email us at contactus@blossomworld.sg. Kindly contact us should you require further information at 64645116 or email us at contactus@blossomworld.sg. We would be very happy and delighted to have your presence for our event and look forward to seeing you.